The facilities are second to none. It makes you feel like a fully-fledged Broadcast Journalist when you’re using industry standard technology. "The facilities are second to none. It makes you feel like a fully-fledged Broadcast Journalist when you’re using industry standard technology (TV Studio, Radio studio, software and equipment.) It really improves your confidence when you can walk into industry already knowing certain aspects." "The staff are brilliant in ensuring we get the best from the course and the facilities available to us. Whether that be on a technical level for using equipment or the lecturers for helping develop your writing style and other key aspects of being a Broadcast Journalist." "Kate Lee is a renowned voice coach who has worked with some of the biggest talents in the industry. Kate came in to give us 1-1 sessions on the best broadcasting techniques, to utilise our voice and come across as professional as possible on air. It was a valuable experience and I’ve taken many techniques from the session." "You have to really make the most of your three years because they go so quickly! It's one of the best courses in the UK and it’s a great opportunity to expand your skills. Seize other chances such as joining an award winning student radio station, Fly FM where so many industry talents started out. Being a part of student media has really helped my development on the degree. It does sound cliché but jump at every opportunity like it’s the last one you’re going to get. It’s the best way to develop your own confidence as a Broadcast Journalist." Have you completed any placements or work experience as part of the course? Could you tell us what these were and what they involved? 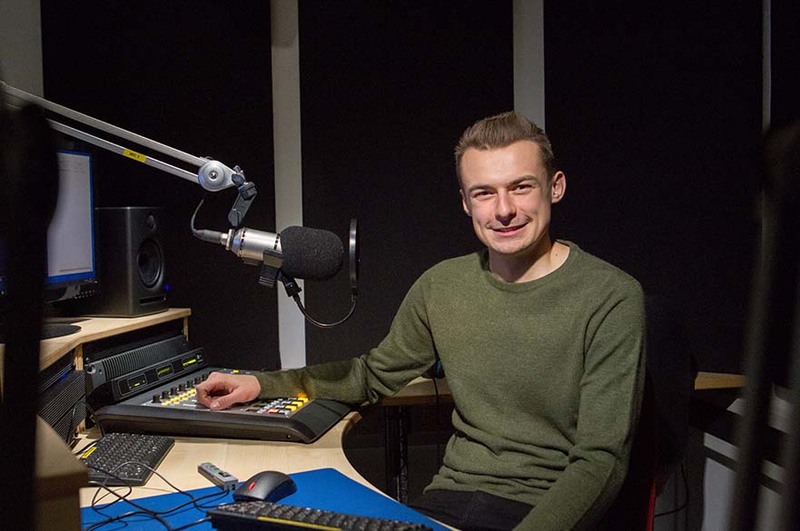 "I completed a week at BBC Radio Stoke Sport – where I was part of the sports team for a week writing scripts for sports bulletins as well as editing audio for air and putting together research notes for sporting action coming up in the area. I have also completed various placements with the Global Radio News Team; I helped write scripts; produce online articles as well as go out as a reporter to get interviews that were then put into bulletins to be played out on Capital FM, Heart FM and Smooth Radio. I also intern with Capital East Midlands Breakfast once a week where I do social media for the show as well as shadowing what the producer and presenters do to get the best content for broadcast." "NTU helped me in getting the placement due to the BBC running a scheme with the BJTC which gives the opportunity for some students on BJTC accredited courses to apply for a work placement within the BBC." What was the most interesting / enjoyable aspect of your placement and why? "The opportunity to work with people who know their job like their back of their hand and picking up some of the best hints and tips I could ever ask for." "Winning Best Male at the Student Radio Awards 2017 – Getting a job at BBC Radio Nottingham as a Broadcast Assistant during my final year at university."